If you were following me on Twitter on Monday morning, you’d know that I made a decision I came to regret: I travelled to work on the train to Caulfield and the express rail replacement bus into the City. In short: the buses were hopelessly swamped by people. It was a long wait (43 minutes) in the bus queue; then a bus trip from Caulfield to the City that took more than an hour. The trip that normally takes about half an hour from Bentleigh to the City instead took two hours.Read this Twitter thread for the grisly details. In the cold light of day, here are some thoughts on this. The information has been pretty good. Lots of signage. Lots of staff making announcements on the train, on the station before the works started. It was pretty clear where to go. There’s also been no shortage of advance warning: signs at local and CBD stations (the latter perhaps a little overwhelming), flyers handed out at stations, announcements on stations and trains, TV and radio advertising, press calls, web site updates. 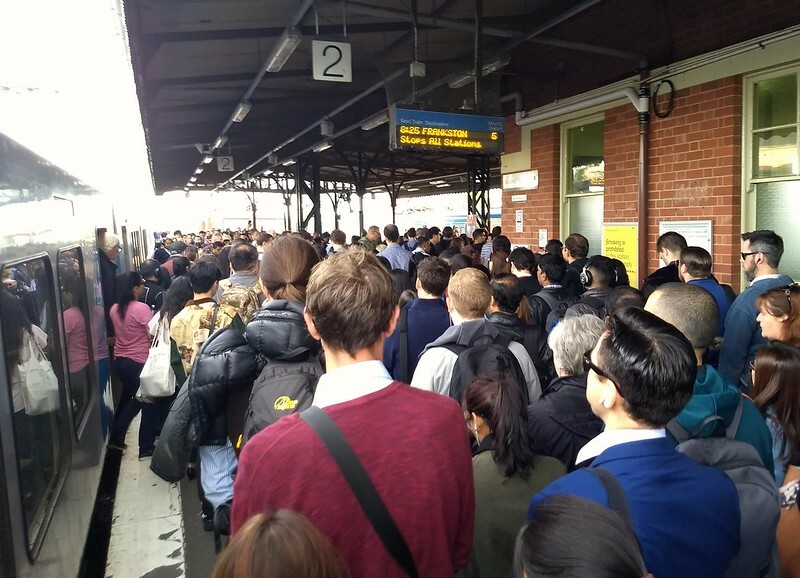 There have been some errors along the way, and some of the media messaging was overly alarmist – leaving for instance some people assuming the Sandringham line is closed every day. It’s not – it’s only closed on some weekends. A simple calendar might have helped. On the ground at Caulfield, they seem to have tweaked the verbal messaging from announcers to say “to the City”, which is much clearer (and more correct) than the previous “to Flinders“. The massive tents at Caulfield are a smart idea. Ideally you don’t want long queues. But if you do have them, you especially don’t want people in long queues in the rain. It reminded me a bit of the queues for rides at an amusement park. But not as fun. I found passengers were remarkably calm while queuing. Maybe they were all posting furious messages on social media, but nobody got visibly shouty or upset, nobody jumped the queue, and (gods be praised) nobody lit up a cigarette inside the tent. Metro was taking the operation seriously. I know this because I saw Metro CEO Raymond O’Flaherty walking around checking things out, with a suitably serious look on his face. It’s school holidays and university mid-semester break (at least for some). This helps reduces travel demand, especially in the morning peak. The trains were quieter than usual. If these disruptions have to occur, now is the right time. 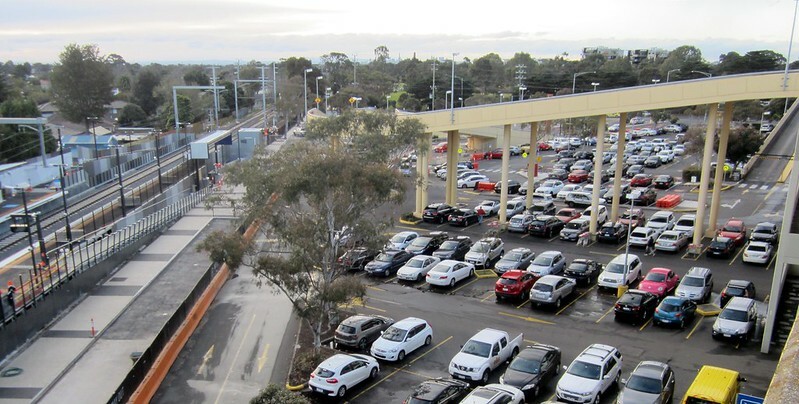 Running a stopping-all-stations every 7 minutes service from Frankston to Caulfield made sense to keep things simple and minimise passenger waits for trains. It’s similar on the Pakenham line, though Cranbourne passengers have to change at Dandenong, which adds to their travel time. Happily for outbound passengers, trains on the Dandenong line run at least every 10 minutes until almost 10pm; until about 8pm on the Frankston line. High frequency makes outbound connections off the buses fairly easy. 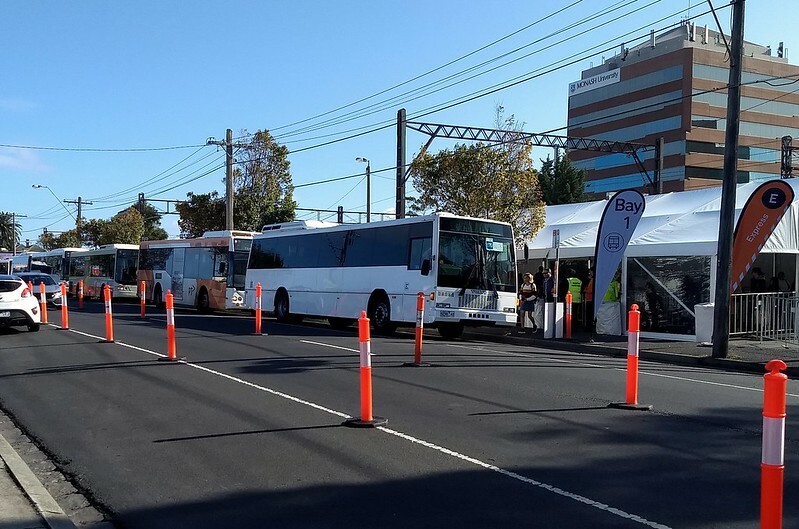 Buses still faced long delays getting across Princes Highway because someone decided that cars on the highway are more important than scores of buses packed with people. Edit: As far as I can make out, the express buses were split between Federation Square (via the M1) and Arts Centre (via Dandenong Road/St Kilda Road). Train delays approaching Caulfield. Ours stopped for about six minutes, but this was nothing compared to some of the delays on the Dandenong line, with some trains stuck for an hour or more. 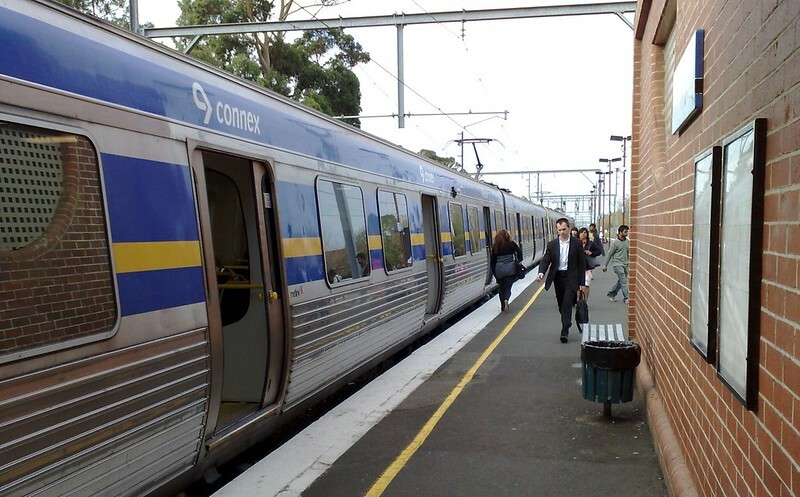 The track layout is also problematic – sometime in the past few years, the layout has been altered so that trains from Dandenong can only terminate on platform 3. The less busy Frankston trains could use platforms 1 & 2. The sheer number of people meant crowding in the subway. The crowding in the subway backed up onto the ramp, and then up onto the platform, preventing empty trains from departing. But the biggest problem was bus throughput. Standing in the queue for that 43 minute wait, there would be times when no buses at all would arrive for 5-10 minutes. Then a few would appear and fill up. The crowds could have been handled much better if the stream of buses was constant. This needs fixing urgently – apart from making some in the queue needlessly wait, it wasted bus capacity that could have been used later in the morning to keep more people moving. Express buses shouldn’t leave unless full if people are waiting. Only stopper buses need to leave with space for more passengers. Bus throughput was also affected by severe traffic delays – buses despatched to the City had a slow trip in, limiting the number of trips they could run. 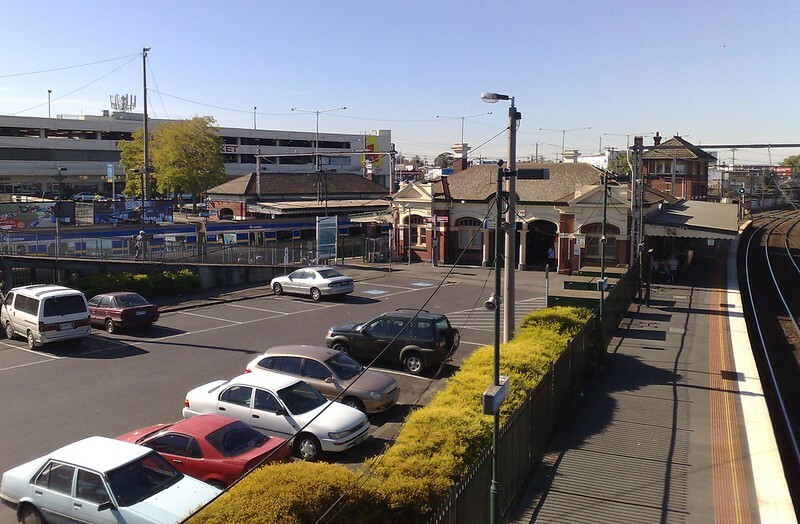 Unbelievably, Normanby Road in Caulfield was still available to general traffic in both directions, with buses having to negotiate a sea of bollards. Did they seriously not think to just close it off? There were also delays on Sir John Monash Drive for buses trying to enter and leave the precinct. 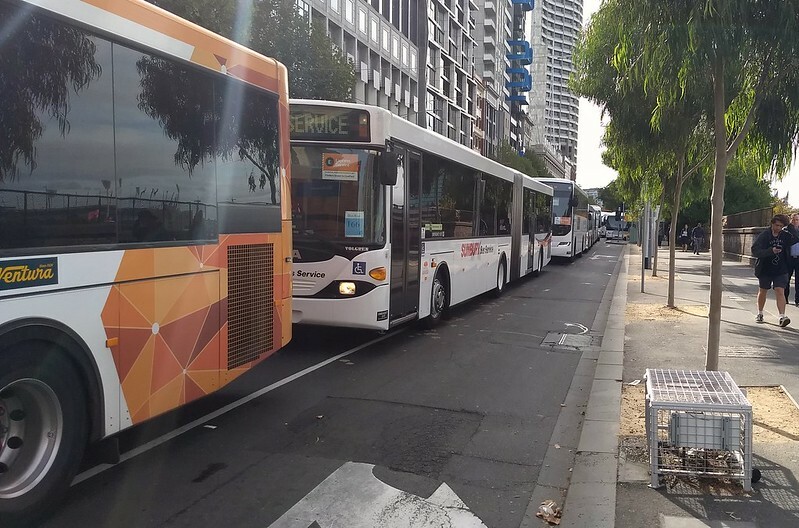 Given the numbers of passengers, it would easily be justified to close down that section of the road (from Queens Avenue to Dandenong Road) to other traffic – or allocate an extra bus lane that can be used to get onto Burke Road. At the very least, more time should have been given for buses getting across Princes Highway. After leaving the freeway there was another crawl along Batman Avenue, mostly caused by the sheer number of buses. At this point on my trip I was looking on Google Maps at the traffic further along and onto Flinders Street and thinking/hoping they’d route some buses over to the Arts Centre to avoid it – as has been the case during previous rail closures. Unbelievably, they didn’t. Instead our bus and all the others headed straight into a kilometre-long queue of buses and other traffic. You know how some people claim that unlike rail transport, buses can easily adapt to changing travel demand and traffic patterns. Yeah. Not unless someone tells the drivers. Eventually bus drivers started letting passengers out to walk the rest of the way. 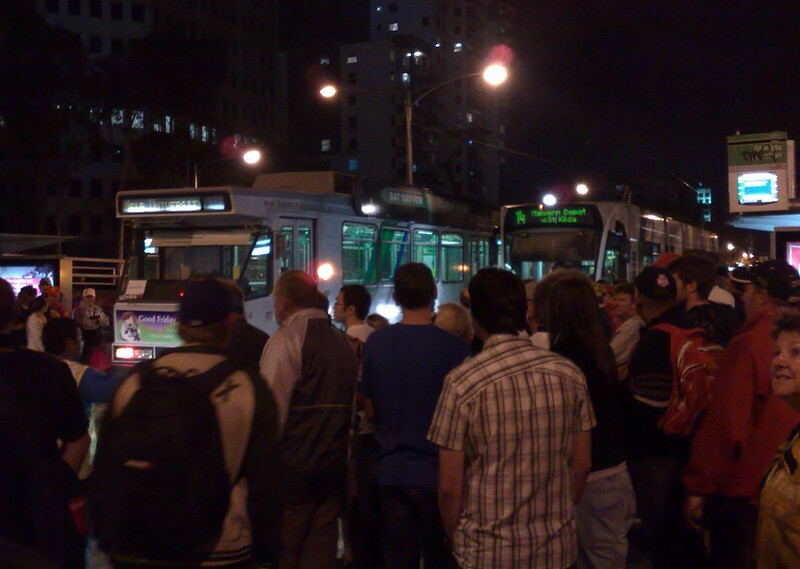 As I walked, I found a long queue of buses all the way to Federation Square. Authorities implied it was because of the vegan protestors occupying the intersection at Swanston and Flinders Street. I don’t buy that. Exactly the same problem happened again on Tuesday morning – with no protestors. And again on Wednesday morning. To me it looked like the bus jam was due to a slow turnaround at Federation Square. 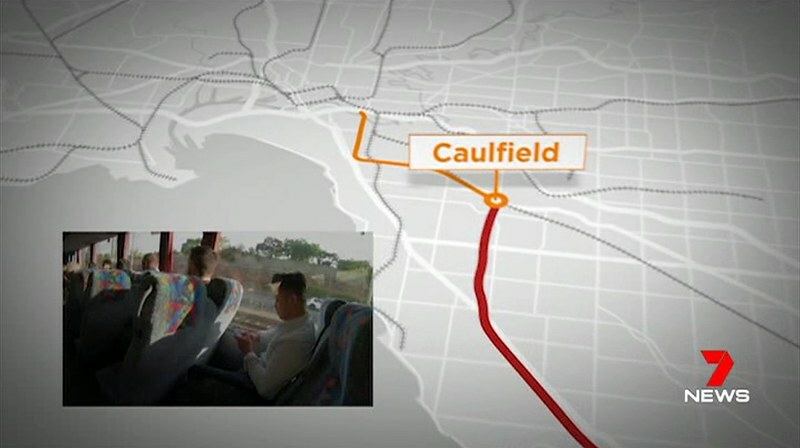 They should have been getting buses unloaded and out again as quickly as possible so they could get back to Caulfield and pick up more passengers. Again the despatch procedures seem to need reviewing. The lack of a dedicated bus lane on Batman Avenue didn’t help either, though it wasn’t as big a problem as on the M1. For a bus and it’s driver, the round trip would have been at least 60 minutes inbound plus 30 minutes outbound. No wonder there were queues at Caulfield. The government says 600 buses and coaches are being used this week for rail replacements, and presumably most of them are on the Caulfield to City run. But are they being used in the best way? Getting everyone to Caulfield by train and then using lots of buses to the City worked during quiet times on the weekend when passenger numbers were lower. It struggled a bit with football crowds, but it really struggles with peak hour commuters. It’s a firm reminder that buses can’t replace trains. It re-created the mess that occurs every weekday on the Doncaster corridor, where buses try to do that job. The Doncaster buses are incredibly messy, but at least they have bus lanes on the freeway inbound, and along Hoddle Street and Victoria Parade. This was specifically ruled out by authorities – who chose instead to rely on traffic light priority (but then didn’t provide it crossing Princes Highway). If they’re not going to give hundreds of packed buses the priority they deserve, would a better strategy be to shift more people onto the neighbouring rail lines, and run extra train services? For passengers closer in, the mix of stopping and express buses from Caulfield to the City would get a better run thanks to reduced passenger numbers and congestion – in the station at Caulfield and on the roads into Federation Square. This sort of operation might use fewer resources, making the overall rail closure cheaper. 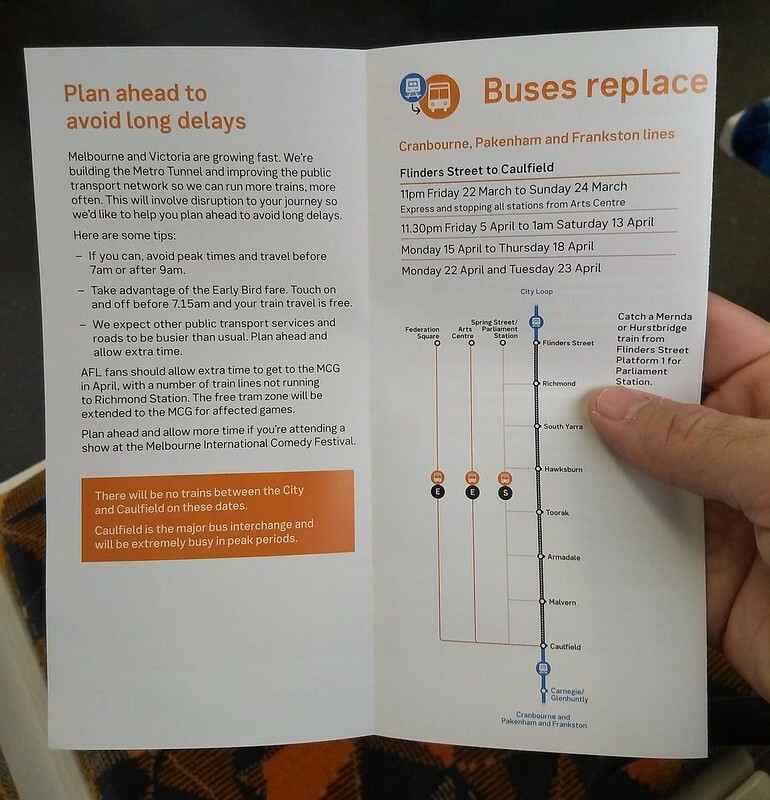 A more radical change would be to run the above Westall and Moorabbin shuttle bus connections, but also deploy some of the hundreds of buses being used to boost local cross-suburban routes that connect the train lines, more widely distributing passengers across more stations. 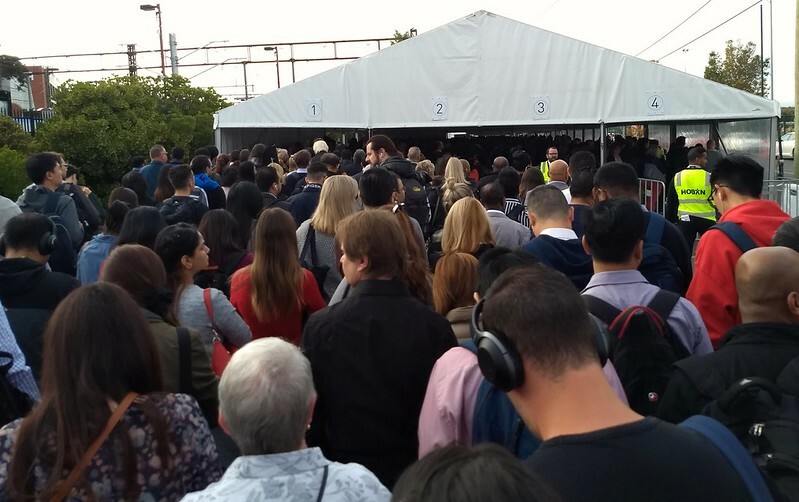 Some passengers are seeking out these local tram and bus routes anyway, including some prompted by advice from Metro staff who knew about the chaos unfolding at Caulfield. 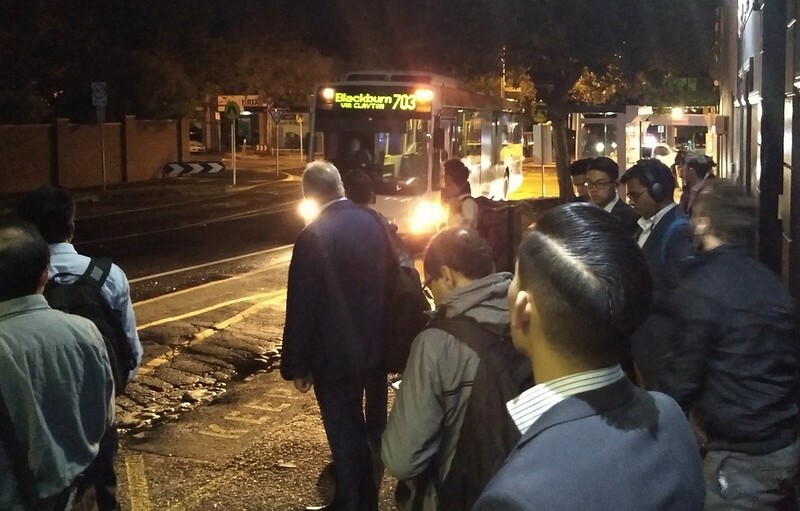 There have been reports of crowding on the 630 bus (North Road) and 67 tram (Glen Huntly Road) thanks to no extra services and (some) use of small trams. Presumably this is also an issue on the inner-suburban tram routes in the southeast. For me, I used this method to get home on Monday. It was 58 minutes from Flinders Street to Bentleigh (via Middle Brighton and the 703), and that included a 17 minute wait for a late bus. Far better than the two hour trip in the morning. Boosting those local bus routes and encouraging their use would be making the best use of buses – which are not really suited for long haul high capacity routes. It would also help educate passengers on their alternate routes during future unplanned shutdowns. Obviously it’s a fine balancing act to try and make sure the swarms of passengers displaced by the rail shutdowns don’t swamp other services and replacement buses. A good balance has not been reached this week. The first weekday is always the worst. The queues at Caulfield have moved better on subsequent days. But that’s not an excuse. As of day three, the bus delays haven’t gone away – on the M1 and Batman Avenue, and around Caulfield, they have continued each peak hour. The strategy used for this works period needs to be reviewed. With continuing (and very welcome) works on level crossings, the metro tunnel, and upgrades for the new trains, these major rail closures will keep happening. 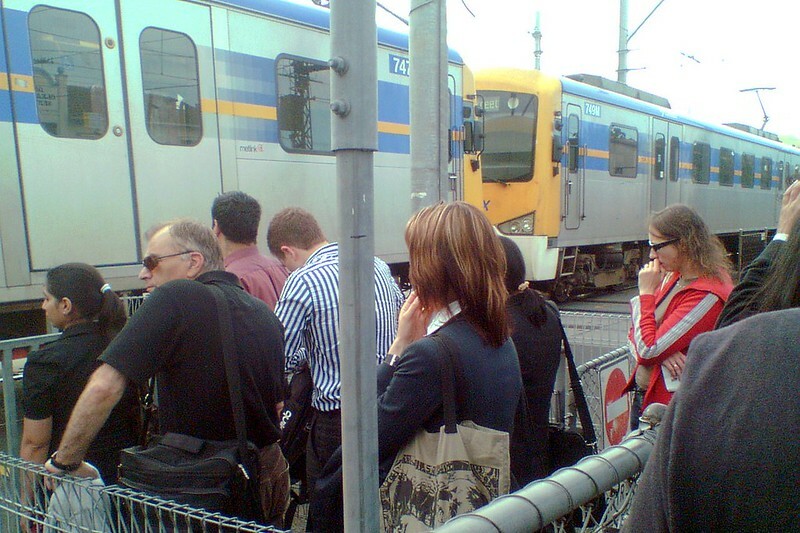 While they do, the city and its transport network need to continue to function. One of the issues that contributes to excessive car use is that it’s not straightforward to calculate the cost of driving. Once you have the car, the cost of each additional trip you take in it is obscured. Apart from tolls and fuel costs, many might see an already-paid-for car sitting in the driveway as “free”, making it an easy option. This is why good alternatives are not based around park and ride, but instead aiming to replace the entire trip, enabling households to own fewer cars. I thought I’d have a go at calculating the total cost per kilometre of my car. Obviously there are a lot of variables, so each person’s result will be a bit different. Depreciation: The Lancer I bought last year cost me $18,000 new. If I assume it’ll be near-worthless by the time it gets 200,000 kms on the clock (I’m not actually likely to drive it that much while I have it, but later owners might), then that’s depreciation of 11.1 cents per kilometre. Some of the other costs are annual fees, so the cost per kilometre will vary according to how much I drive. The Australian average is 15,000. We’re well below that in my family, though it’s increasing a bit since one son got his P-plates last month. I’m going to use 8,000 km as an estimate. Insurance: $708.20. 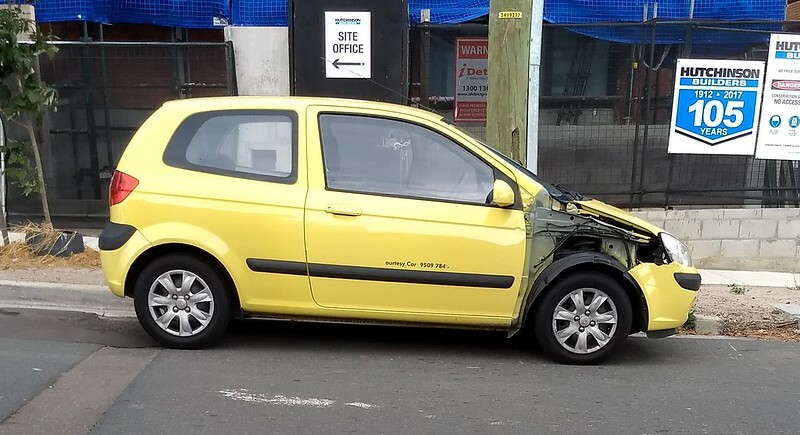 (It’s definitely gone up since having a P-plater behind the wheel!) That’s 8.9 cents per kilometre. Registration: having just bought the car, it was paid for the first year, but ongoing annual cost is $816.50. That works out to 10.2 cents per kilometre. Servicing: This will vary a lot, and will get more expensive as the vehicle gets older. But for now, because I bought a brand new car, this is capped at $230 for each of the first three years = 2.9 cents per kilometre. Petrol: The car’s got an information display which can tell you various things. One is how many litres per 100 kilometres it’s burning. From my observation this usually varies between 6 and 10, depending on whether we’re driving on country freeways with little traffic, or start-stopping along a busy city road. (On the bright side it never gets driven in commuter peaks.) The official government number for a 2017 Lancer is 7.4, but let’s be a little pessimistic and use 8. How much does petrol cost? The Australian Institute of Petroleum reckons in Victoria the average price in 2017-18 was 135.2 cents per litre, which seems roughly right, though I wonder if it’s creeping up. So every 100 kilometres we’re using $10.816 of fuel, or 10.8 cents per kilometre. What about tolls? We only use tollroads occasionally, perhaps about $50 per year, so I think I’ll exclude this for now. So the cost for me is: Depreciation 11.1 + insurance 8.9 + rego 10.2 + servicing 2.9 + petrol 10.8 = 43.9 cents per kilometre. Obviously there are a lot of costs that motorists don’t pay for directly. Driving is very heavily subsidised. But having a number, even if it’s only an estimate, means I can quantify how much it’s costing each time we use the car. Did I miss anything, or mess it up? What’s the cost in your household? Leave a comment! The Victorian Department of Transport is expanding, absorbing Vicroads and PTV to one big agency. We’ll have to see, but potentially this could be good. Better integration of different transport planning roles could benefit street-based public transport in particular. Recent changes, moving some PTV roles into DOT (and/or the apparently shortlived Transport For Victoria) were just confusing. Major projects authorities, such as those delivering the metro tunnel and the North East Link, will stay separate. The most visible thing to the public is the branding. Does this change mean yet another expensive re-branding exercise, putting new logos on everything? The current PTV designs are mostly good – the colours, lines/patterns, typefaces all work quite well. The PTV logo itself is a bit meh – maybe it’s possible to start by just removing it. 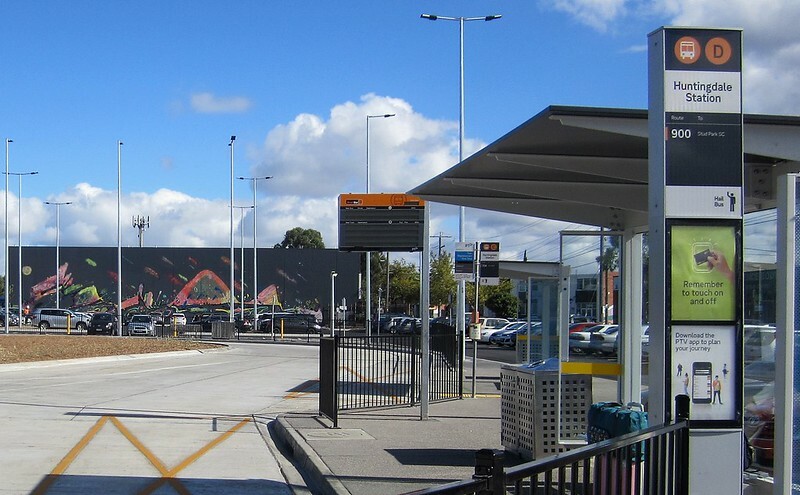 But the whisper is that the branding already seen on the Mernda line extension and the Huntingdale and Monash bus interchanges shows the way forward – most signs with no operator branding. 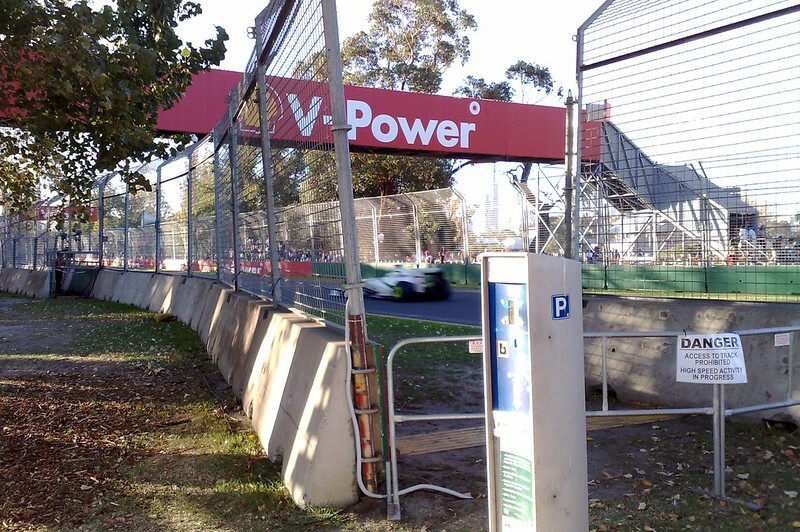 What this means for Vicroads branding is another question. Of course, it’s how this new body works, and whether it provides improved planning and delivery, that really counts. Time will tell. PTUA: State concludes its re-centralisation of transport planning: but to what end? Mobile Myki was made permanent last month. Even though for now it’s only available on Android phones, it’s great that it’s increased the options for public transport ticketing. So if you’re a senior (60+) and you want to use Mobile Myki? No problem – grab your Android phone with NFC, install Google Pay and load it up. If you’re a tech-savvy tertiary student, with a PTV Tertiary Student Concession Card, and you want to use Mobile Myki? Not so fast! It turns out only a few specific types of concession fare can be used with Mobile Myki. – General Concession (Code GC) – Interstate Seniors Card and Interstate Pensioner Concession Card holders only. For all other concession categories, Mobile myki is not currently available, and another type of concession ticket must be used. Apart from tertiary students, Health Care Card holders are also excluded from the list, as well as some other types of concessions. Children under 16 are excluded, perhaps because Google Pay needs to be linked to a valid credit or debit card. Why is this? I don’t know, but I’ll see if I can find out. Given it works fine with Visa and Mastercard debit cards, there should be no concerns about the use of credit cards for low income earners. Maybe there’s a good reason. But it seems completely illogical to exclude a huge number of tech savvy public transport users who happen to use concession fares. UPDATE Monday 5:30pm: The government has been in contact to advise that tertiary and other concession card holders can use Mobile Myki, by choosing the “General concession” option in the app. It appears the Fares And Ticketing Manual, normally the bible for these types of issues, is incorrect – perhaps the new Mobile Myki information was added in a hurry. Here’s another one of my regular posts of ten year old photos. That month I upgraded to a Nokia N95 phone, which took far better photos than its predecessor, the Nokia 6230i. …and the level crossing in the afternoon. Easter was approaching. 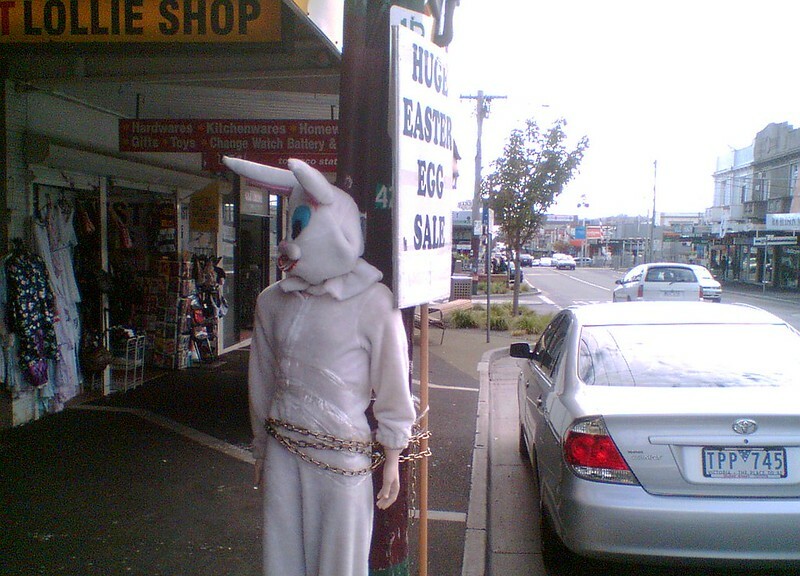 In Centre Road we see a rather cruel way to treat the Easter bunny. 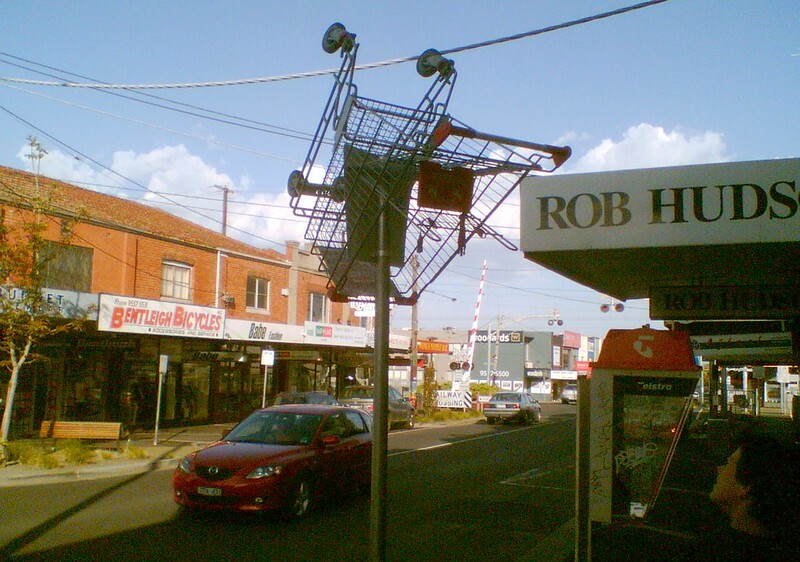 Supermarket trolley as art? As in the photo above, the level crossing (now gone) is in the background. It also appears at the time that Telstra didn’t take great care to keep their payphones clean. This is also adjacent to the old electorate office of then state member for Bentleigh, Rob Hudson. 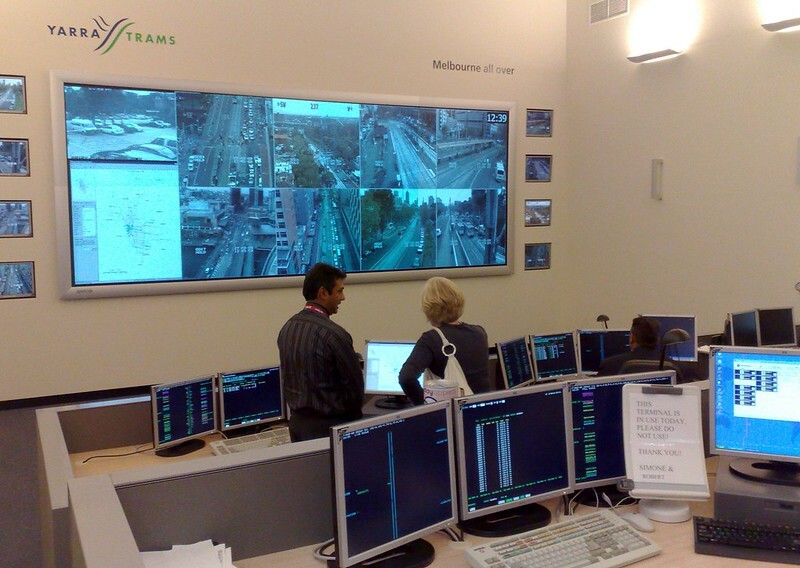 A trip to the Yarra Trams control centre, then in Eastern Road, South Melbourne. I’m not sure these days that they’d let me take a photo. 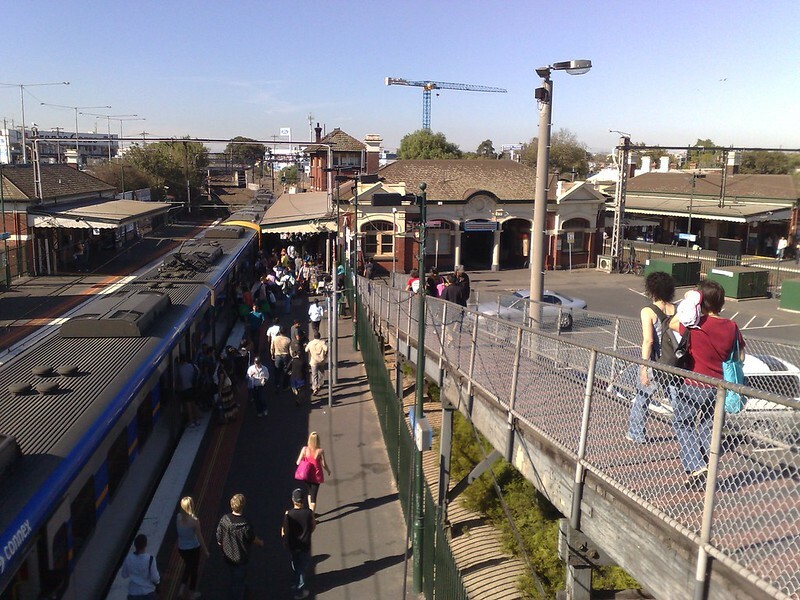 Footscray station, before 2009-2010 pedestrian bridge upgrade, and before the Regional Rail Link added two extra tracks (and resulted in the upgraded bridge being partly demolished so it could be extended). These photos were taken for an April Fools Day gag. I must have been up early this morning. 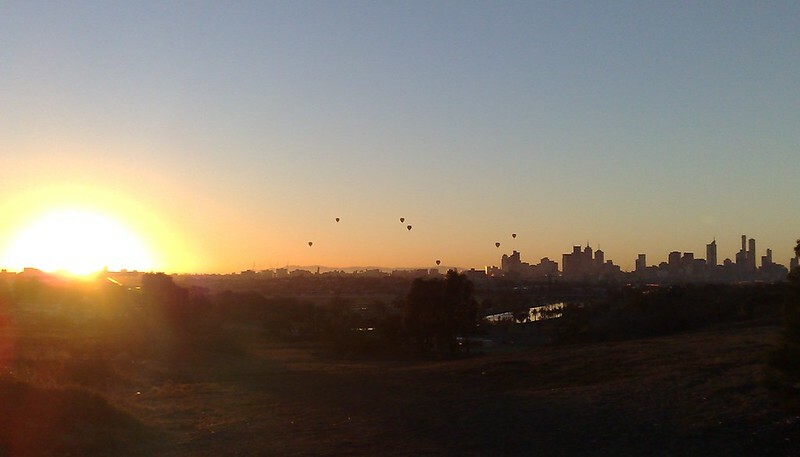 Hot air balloons over the City. I went to the Grand Prix. I have little interest in Formula 1 cars – I went to see The Who perform after the race. 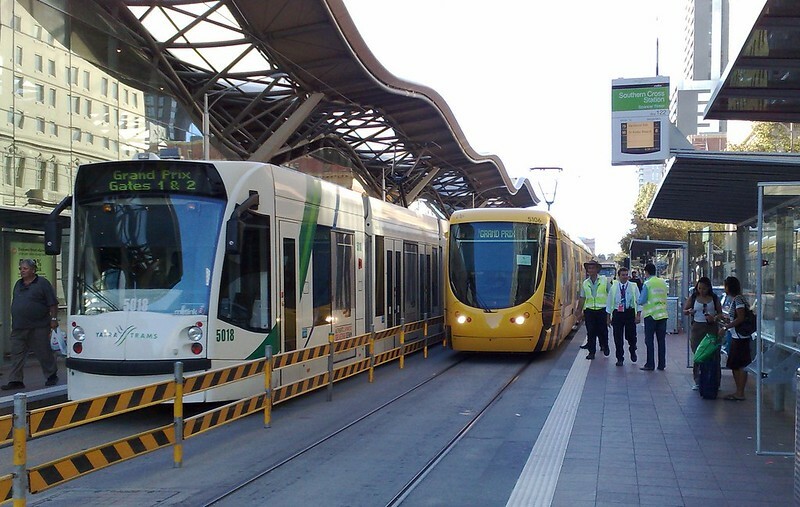 Here we have trams to the GP departing from outside Southern Cross Station. I wandered around the GP circuit waiting for the concert to start. I’d have to admit the cars are impressive from an ear-splittingly-loud and very fast perspective. While the tram shuttles back into the City were very good, those heading outwards were less impressive (this is St Kilda Junction), and the rest of the network was running its standard poor Sunday night frequencies, so I had to wait ages for a train home. The next day I got this point into Hansard.